ww2dbaseChen Jie (Wade-Giles romanization: Chen Chieh), courtesy name Chen Zheqing, was born in Hangzhou, Zhejiang Province, Qing Dynasty China in 1885. In 1902, he completed education in Hangzhou and was sent abroad to study in Japan on government funding. In Tokyo, Japan, he studied at the Kobun Gakuin (an institution founded by Japanese educator and Judo founder Jigoro Kano), No. 1 Senior High School, and Imperial University (now University of Tokyo). In 1907, he was sent to Berlin, Germany, where he would study political science and western languages (German, English, French, and Latin) at the University of Berlin (now Humboldt-Universität zu Berlin). He returned to China in 1912, which had just seen the fall of Qing and the rise of the Republic. Entering government service, he served in various positions in a number of departments. 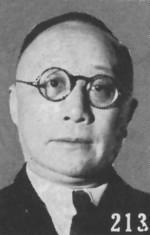 Meanwhile, he also concurrently served as a professor at the Government University of Peking (now Peking University). In 1928, he left government service and held management positions in the banking industry for the next seven years. ww2dbaseIn 1935, Chen was recruited into the foreign ministry. In 1937, when full scale war between China and Japan initially broke out, he met with Japanese diplomats in China, demanding immediate de-escalation and apologies; none of which would be granted. In 1938, he was made the ambassador to Germany. He arrived in Berlin in Sep 1938, and, per protocol, he submitted his credentials to the German foreign ministry. To his surprise, the German government did not formally accept him as an ambassador; at that time, the German foreign ministry was busy establishing diplomatic relationship with the Japanese puppet state in northeastern China, the so called Manchukuo. In Nov 1938, Chinese leader Chiang Kaishek, in an attempt to save Chen's face as well as to save China's face, suggested Chen to either relocate to Britain or to return to China, but Chen asked for two more months while he continued to pressure the German government. Finally, his credentials were accepted by the German government in late Dec 1938. 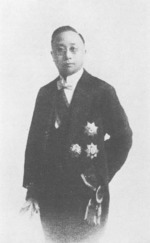 He immediately embarked on projects to maintain the long standing friendly Sino-German relationship, suggesting that even as Germany officially favored Japan in the Second Sino-Japanese War, China and Germany could still have a friendly relationship in secret, thus ensuring mutually beneficial economic arrangements in the post war era. In Nov 1940, German Foreign Minister Joachim von Ribbentrop met with Chen, suggesting that he might be able to mediate peace between Japan and China; Chen rejected the offer, noting that China's defensive war was just, and China would not negotiate with an aggressive power. In Jun 1941, Germany began to contemplate recognizing Wang Jingwei's puppet regime in China. His counterparts in the German foreign ministry was sympathetic to Chen's cause, but expressed their inability to change the minds of the top Nazi German leadership. In early Jul 1941, Chen received word from his superiors in China that, should Germany establish diplomatic relations with Wang's regime, China would cut ties with Germany. On 10 Jul 1941, abiding by this order, Chen shut down the operations of his embassy. ww2dbaseWhile Chen was still the ambassador in Germany, his subordinate in Austria, Ho Feng-Shan (Pinyin romanization: He Fengshan) issued visas to save Jews from Nazi oppression. Chen reprimanded Ho for taking such action, noting that Ho was disrespecting the laws of the host country. 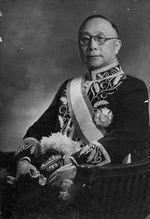 ww2dbaseIn 1943, Chen was made the Chinese ambassador to Brazil. In 1944, he became the ambassador to Mexico. In 1945, he became the ambassador to Argentina; he passed away due to sickness while serving in this role in Buenos Aires. 9 Jul 1937 Chen Jie met with Japanese diplomat Hidaka Shinkurou, demanding Japan to de-escalate the situation in northern China, to apologize, to punish the officers responsible, and to discuss reparations. 21 Sep 1938 Chen Jie was made the Chinese Ambassador to Germany, succeeding Cheng Tianfang. 28 Jun 1941 Chen Jie submitted a letter to the German government, noting the long standing friendly Sino-German relationship, urging Germany to abandon its wish to recognize the Japanese puppet regime in China under Wang Jingwei. 2 Jul 1941 In Germany, Ambassador Chen Jie received orders from China, noting that should Germany recognize Wang Jingwei's Japanese-sponsored puppet state, China would cut diplomatic ties with Germany. 10 Jul 1941 Chen Jie ordered the operations of his embassy in Berlin, Germany to be shut down, thus officially cutting diplomatic ties between Germany and China.